Newly released data and photos show how shockingly low an Air Canada jet was when it pulled up to avoid crashing into planes waiting on a San Francisco International Airport taxiway last month. The Air Canada pilots mistook the taxiway for the runway next to it and flew their jet to just 59 feet (18 meters) above ground before pulling up to attempt another landing, according to National Transportation Safety Board information released Wednesday. That&apos;s barely taller than the four planes that were on the taxiway when the incident occurred late at night on July 7. Pilots in a United Airlines plane alerted air traffic controllers about the off-course jet, while the crew of a Philippine Airlines jet behind it switched on their plane&apos;s landing lights in an apparent last-ditch danger signal to Air Canada. NTSB investigators said they have not determined probable cause for the incident that came within a few feet of becoming one of the worst disasters in aviation history. "It was close, much too close," said John Cox, a safety consultant and retired airline pilot. 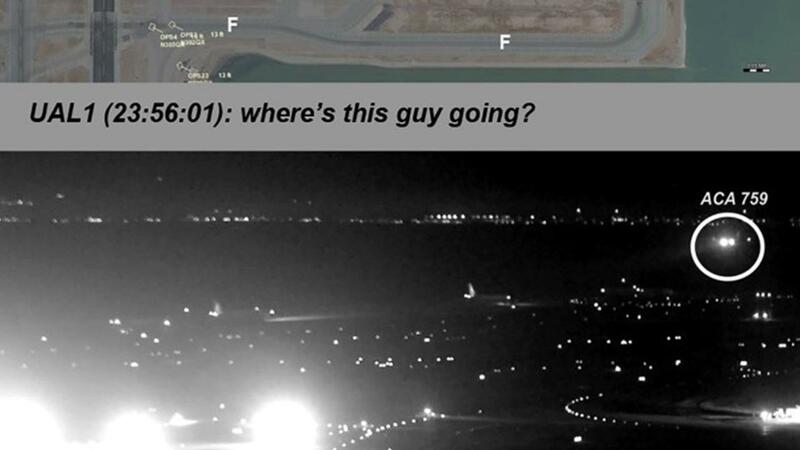 The investigators said that as the Air Canada jet approached the taxiway just before midnight after a flight from Toronto, it was so far off course that it did not appear on a radar system used to prevent runway collisions. Those systems were not designed to spot planes that are lined up to land on a taxiway — a rare occurrence, especially for airline pilots. But the Federal Aviation Administration is working on modifications so they can, agency spokesman Ian Gregor said. Both pilots of the Air Canada Airbus A320 jet were very experienced. The captain, who was flying the plane, had more than 20,000 hours of flying time, and the co-pilot had about 10,000 hours. The pilots told investigators "that they did not recall seeing aircraft on taxiway but that something did not look right to them," the NTSB said. Investigators could not hear what the Air Canada captain and co-pilot said to each other during the aborted landing because their conversation was recorded over when the plane made other flights, starting with a San Francisco-to-Montreal trip the next morning. Recorders are required to capture only the last two hours of a plane&apos;s flying time. Peter Fitzpatrick, a spokesman for Air Canada, declined to comment, citing the ongoing investigation.